Once upon a time there was a boy called Aodan. He was 8 years old and lived in Scotland. Aodan knew that there was a building in London that was nicknamed The Gherkin – because of its shape and its colour. He really liked this building. He drew pictures of it, had a jigsaw puzzle of it and even had a Gherkin bed cover. When it was the school holiday in Scotland, Aodan visited his aunt and uncle who lived not very far from London. One day they all set off for a day out in the big city. Aodan was thrilled to see the Gherkin among all the other large buildings on the city skyline. As they walked from place to place he noticed that the Gherkin seemed to be getting bigger and bigger – and he became more and more excited. At last they turned a corner and there – at the end of that very street – was The Gherkin!! Aodan was so thrilled that he jumped up and down and ran around in circles. He even went right up to his favourite building – and touched it! He couldn’t have been happier. Aodan is my youngest nephew. I don’t know why he is so fascinated by The Gherkin but when we took him and his brother to London for a day earlier this summer the only thing he wanted to do was to see the Gherkin. What he didn’t expect was that we would get close enough to touch it. I have never seen him so excited!! When the theme Happy was announced this was the obvious choice of subject for me as I will always remember that day in London when Aodan was so very very happy. 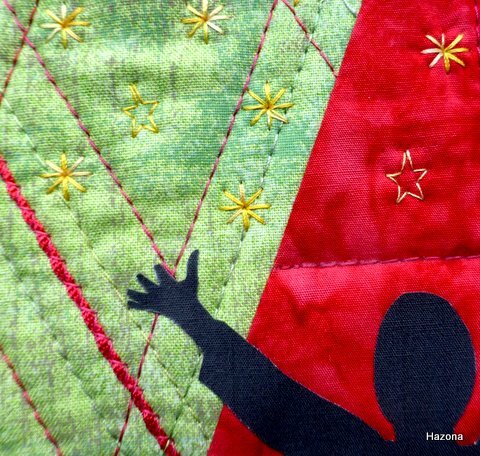 My quilt is made from all cotton fabrics and threads, except the couched red cords which are polyester. The diamond pattern of quilting reflects both the Gherkin’s structure and the tartans of Aodan’s homeland. I like the fact that the 2 parts aren’t symetrical and the contrast with the dark silhouette. Helen you have created a lot of interest in our square format, the diagonal line works for me. And the contrast between either side is riveting. Congratulations on a well designed quilt. Love the story behind this, a very effective interpretation. I love the story and the way you have brought it to life. The diagonal stitching really does depict the Gherkin’s architecture, and the silhouette is a joyous one! 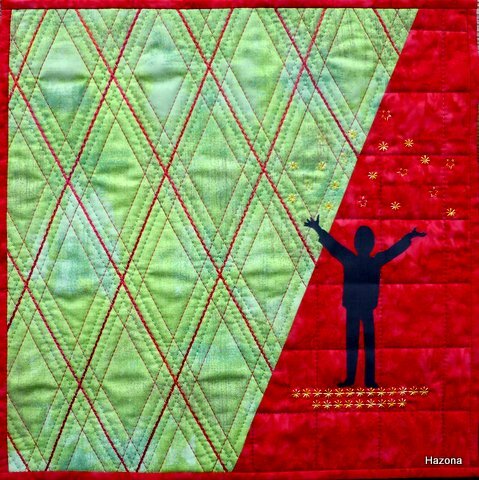 I looked at the Gherkin on Wikipedia and a big bravo how you created this in your quilt. Great design. Must be a great memory for your nephew.